It’s been a little while since I published a review by Patricia Prime, so I was excited to receive this in my inbox today… Discovering a new haiku/haibun collection is always a joy so I hope that this review resonates deeply with many of you. It is good to find a haibun poet’s efforts in print and Pineola have done a satisfactory piece of work in publishing Glenn G. Coats in this volume. We are told in the blurb that the book is a “memoir of another time, narratives about being a son, a brother, a friend.” Coats is also the editor of haibun for the online journal Haibun Today. Coats is always perceptive and often witty, and he writes with restraint and great care in his use and juxtaposition of prose and haiku in this book. More importantly, he is able to introduce an unusual perspective or unexpected viewpoint that amuses, compels thought, gives new insight, or occasionally startles or disturbs. I see him the night before trout season opens. We are up all night talking; picking through my father’s ashtrays for butts long enough to smoke. In the morning Jack puts on a new fishing hat, and his boots and creel are also new. I see me not much later reading Jack’s one letter from Vietnam, the one where he tells the truth, the horror, and the pain of it, but I am to promise to tell no one. He survives the war only to crash a motorcycle back in the states and for a time he is sucking food through a straw. We don’t know whom to pity more, author or Jack. The simplicity of the narrative deceives. The spotlight Coats turns on himself and his cousin both amusing and poignant. My son’s legs begin to wobble. We send him into the cabin for a Coke, but he doesn’t return. An old salt curses through the door, says some kid heaved near the kitchen. We lead him back on deck where he falls like a coat on a bench. We fall down the road like raindrops from a tall tree. It is dark, no lights yet in the houses. Bicycles whir down the hills and fishing poles point like antennas from the handlebars. Canvas creels flap against our sides, Thick hip boots tug at waists. Fingers are numb from the cold. The year that I had wood shop, I made a broom holder out of poplar and a book shelf. The wood was green in color; easy to cut and sand. It is Saturday night and the band at Turntable is warming up. A few of us linger on the sidewalk. Our conversations are muffled and hard to understand as if we are talking underwater. The police know the boys and say they are always getting in trouble. Nothing they can do about the bike. Mama doesn’t keep a record of the serial number and the policemen say it is our word against theirs. No proof. Conlyn lays his stick down beside the path. “I don’t need this stick anymore,” he says as he stoops down to pat Millie on the head. Coats has developed as an interesting haibun poet. His craftsmanship is impressive: language honed to be the instrument of intellect, wit and observation. Occasionally he lets us into that closely guarded inner sanctuary, as much by implication as by direct words. Keeping up with new releases world wide is a difficult thing to do… thank goodness for reviewers like Patricia Prime! Here’s a review of John Parsons’ new collection, In a New Garden. 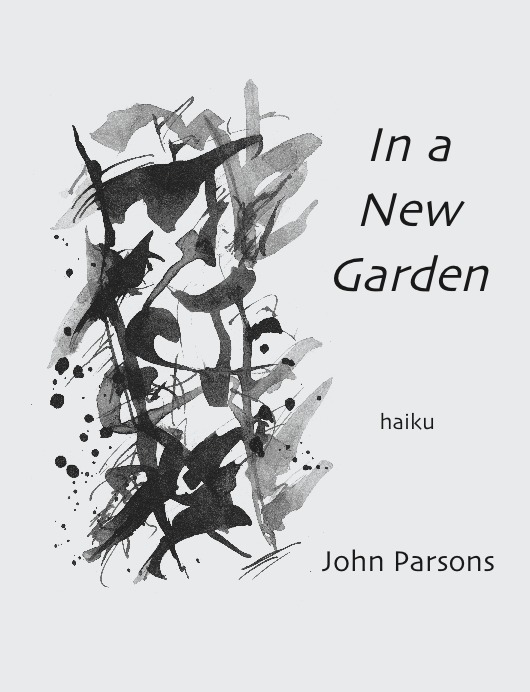 In a New Garden: haiku by John Parsons. Oxbridge, UK. Alba Publishing. www.albapublishing.com. I was delighted when asked to write a comment for the jacket of John Parsons’ latest collection of haiku In a New Garden and, declaring this; I am equally pleased to review the work since I consider it to be one of the finest collections of haiku I have read. In his Preface to this fifth collection of haiku, Parsons writes, “This book is largely extracted from work over the past year, a time of upheaval and resettlement.” The book is divided into the seasons of the year; each season being prefaced by one of Parsons’ drawings. The haiku are set out three to a page, in indented lines, with plenty of space around them. If you enjoy haiku, here is a volume full of delights and surprises. The strength, energy and compassion of Parsons’ haiku are impressive, and it is reader-friendly without ever being shallow. He brings a wealth of meticulous observation and personal experiences to his writing, through which we are better able to recognize ourselves and our surroundings. He invites the reader to share his vision and knowledge, and to discover with him, both human nature. 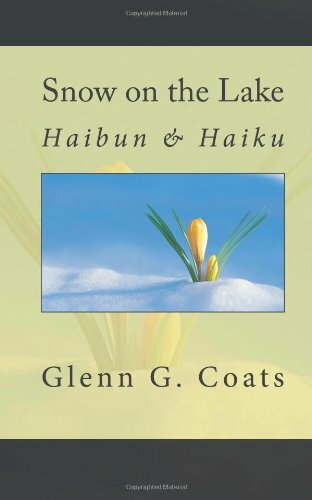 As I read and reflect on Parsons’ haiku, in all four sections of the seasonal year, I realize how the many layers of meaning of those title words – Spring, Summer, Autumn, Winter – are embedded in this collection, adding to its depth and the way the haiku work on the reader’s imagination. By the closing poem of this section, the poet, fully aware of his own blessings, is able to give a “coin for the busker” and to hear him burst into song. each haiku having a fine feeling both of the musical and the “painterly” about them. Here we see “the moment under the moment”, the past that’s always there beneath the present. where his minute observation is a compelling drive. “joints stiffen / every elbow of twisted hazel / a nodule of ice”, the indelible image of “just enough light / the robin’s breast / gives dead nettles life” and “loneliness / evening sun on the seat / never sat on”. Whatever he writes about, Parsons always remains connected with the natural world and is sustained by it and even when he probes darker subjects, the sense of wonder it inspires shines through. He uses language powerfully to make us experience the world as he does, to hear birdsong, to feel the sun or the cold, to smell perfume or to sense the pain of stiff joints. His haiku shimmer with light, movement and colour, with sensual images that stay in the mind long after the book is closed. Again, I am privileged to publish this review by one the world’s keenest haiku minds, Patricia Prime. This time she reviews one of the prolific Steven Carter’s latest collections. Steven Carter’s work as a haiku and haibun poet has appeared regularly over the past year, and may therefore be familiar to readers both in the USA and elsewhere. The variety of haibun in The Hidden Berkeley is engaging. Over 30 haibun, a Prologue and Epilogue range across Carter’s life from the age of eighteen when he was a college freshman to his departure from Berkeley in 1967. Carter’s collection of haibun, which vary in length from one to two pages, spans several years. The autobiographical sketches include vivid moments of encounters with the world, life-changing events, his love life and engagement with people that shaped him. That Christmas we don’t buy a tree. My mom is too tired, I too depressed, my teen-age brother too indifferent, to clean up the house. Reading the poem on the page, the words are transmitted through the imagination and the reader’s own memories into a silent cadence that in turn shape the images. It is very easy to identify with many of Carter’s experiences and his various attempts to come to terms with his feelings as he tries to find his place in the world. To my impoverished and callow twenty-year old sensibility, Marcia, the willowy teen-ager next door on Hearst, is like water on a table-top; fun your finger through it and it leaves no trace of where it was. Every night, at the agreed-upon time, she flashes her bedroom light twice and, as I look on from my kitchen window, bares her beautiful breasts to me. Discouraged with the lifestyles of both her sons, but especially of Allan, my mother confided in me shortly before her death that the best my brother could hope for was a career in the army. In 1989 he was appointed to the Solana County Municipal Court Bench by the governor of California. but also to forget what had happened in August, when Kim, the San Diego girl I wanted to marry, pulled the plug on our relationship. Drowning my sorrows in schoolwork, I figured, would kill two birds with one stone. I was half-right . . .
What is evident from this volume is how often Carter’s haibun concentrate on the big issues of existence: life and death, love and hope. These poems are strongly influenced by the particular timbre of the language, formed by the contours of the landscape and the life-rhythm of modern-day America. That said, they are crowded with impressions of light and darkness, summer and winter months: an existential searching for identity and context. The intensity of many of these haibun grows out of their truth, their reality. Moments are preserved, and the trigger of memory is released. Place, people and events weave a dance through haibun that evoke a beauty and power, treading a path through a life that is full of sadness, joy, wonderment and hope. When I was young, like all kids I expected adults to walk the straight and narrow and the world to be a more or less place. Then, one by one, my idols crumbled, as they must: my grandmother’s jolly grocer on the corner of Addison and Grant in Berkeley, who always sat me on the counter and sang a song in Italian, went to jail for tax evasion; the director of one of my foster homes, whom I’d begun to consider a second mother, went to jail for embezzlement; my grandmother herself, it turns out, played the ponies and financed her gambling habit by stealing from my step-grandfather; and so on. These revelations were shattering once upon a time, but now I accept them, having learned in late middle age that forgiveness at a distance is a privilege, if not a luxury. The Hidden Berkeley is replete with images, ideas and stories of the making of a man – of ordering and disrupting order, of the complex relationships between families, friends, colleagues, as well as with the placement of each within the history of one man. Throughout the book Carter works with a multiplicity of stories and draws the reader into associative ideas, bringing the reader to an ample understanding of the complex historical, cultural and philosophical foundations of his life. What might be poetic sketches from life becomes another field of composition: life as an artwork. The poet’s life compressed into this book unfolds ideas both minute and complex. The collection contains fine examples of individual haibun and it also forms a cohesive whole as an autobiography. Carter presents an interesting way for haibun to be expanded from travel writing, or journal writing to a diary of awakening maturity. It’s always a pleasure to post one of Patricia Prime’s reviews, but tonight, the pleasure is even greater, as the review is of a collection by one of our great ambassadors for Japanese forms, Beverley George. If you are not familiar with Beverley’s work, this is a real treat. Wind through the Wheatfields is a collection of tanka responses and tan renga featuring the work of Beverley George with many of the poets with whom she says in her Preface, she has “shared workshops; conferences, meetings; readings; a loved book; a point of view.” The poets come from several countries: Australia, New Zealand, U.S.A., France and South Africa. The book is beautifully illustrated by Pim Sarti and has been designed by Matthew George. In this volume we see the way in which the challenge facing the contemporary poet writing tanka responses and tan renga forms, that date back to the Japanese Nara and Heian Periods, are currently manifesting themselves. How does one write tanka responses that are still recognizable as such without merely repeating what has already been done by others? And how do you write a tanka response that attempts to address wider issues? In these forms, the poets cover many subjects, from science fiction to beach softball. The achievement and success of these now very well-known forms, written in many languages world-wide, attract a good following. Many people are drawn to them as literary exercises, a challenge in conciseness, while others may enjoy the companionship of writing in tandem. The humility and the ambitions are finely balanced in the poems collected here. is considerably skillful and finds a precise rhythm for the subtlety of what is being said. What is being “said” in these poems? Is it that we are alone in our own dreams and dramas, as we see in the tan renga “Converging Worlds” by Beverley George and David Terelinck? willow fronds in wind . . .
Or is it that beauty can be found wherever one lives in the world, as we in this verse by Giselle Maya from “The Other Side of Blue”? In the way images carry fleeting glimpses of meaning, the poem reveals the poets’ concerns with family. There are the elusive images of “mother’s honey suckle”, ”grandma’s stories”, “her first-born child’s / nervous win” and the “antique chair” which we might imagine once belonged to a loved one. like that of passing gulls? The poem successfully mixes memories of the poets’ own childhoods, which are significantly different from those of contemporary children. grandpa’s shed . . .
Browsing, exploring, appreciating, finding inspiration, or simply enjoying the expression of our common humanity in such a rich variety of writing is a delight. For me, this collection proves most successful when the poets voyage into the past. That these poets are masters of the intellect, of words, of the tanka response and tan renga forms seems indisputable. The heat has finally dissipated and the last night of spring has opened in all of its glory… the perfect night for reading and contemplating haiku and its related forms. As you all know, Patricia Prime is one of my favourite reviewers, so it is again, my pleasure to be posting this recent review. James Norton worked in the field of therapeutic horticulture and teaches within the Shambala Buddhist community. He has been an editor and is a founder member of Haiku Ireland and the Redthread Haiku Sangha. The Fragrance of Dust is his second collection of haiku and haibun. Norton is a thinker, a lover of the lyric line, so it is that certain words can be applied to his writing: modest, assured, precise and finished. This is a poet who likes structure. His collection is subdivided into nine sections, and inside the sections there are haiku, poems and haibun. Baby William Butler Yeats was wheeled in a carriage through these streets. Young Stephen Dedalus strode into eternity along this strand. There Bloom ever wanders, ogles Gertie while his Molly plays. Which is real, who imagines? A Sunday morning in early July after a night of warm rain, clouds promising more, the air tumescent with scents. At Lansdowne Bridge on impulse cycle upstream along the Dodder – An Dothra, the Flood – towards Ball’s Bridge. City children holidaying. There am I in sepia, seated on a donkey, its ears back, not pleased. No more I am myself, braving it, but her arm around me and she smiling. Happy then. The sounding water rushes on. Something shifts. The truth of being as it is. Place and moment gather into completeness. We limp back to Plas Plwca as night falls. Bedlam at the airport. It seems we all want to leave. Security can’t cope. I miss the flight, and ring to say no go. Then I’m on standby. Six hours to explore Departures. The trenches and sandbagged redoubts are reconstructions but the scouring wind and the sense of melancholy in these hills is real. Apartments from the soviet era squat beside crumbling brick barns, greying timber houses. Implements in yards, each eloquent in its own, the broken and the useful, in rain and sunlight, idleness and labour, just as they are. Black soil of vegetable plots, turned and ready. Then to the figure-8 go-kart track. Around and around he goes at a sedate pace while I watch. Tiring of it, I go back to the van for a snooze, leaving the attendant to keep watch. See him raking leaves on a winter’s day, bent to his task, hoodie shadowing his face, he’s a diminutive serf locked in the margins of a Book of Hours. See his absorbed expression listening to vintage reggae – he’s burnin’ Babylon. Job done, he pauses in the roadway, looks about expressionless. The blower’s nozzle swinging idly across the detritus of chipping randomly patterns the underlying surface. He squeezes the throttle gently. Shapes appear and dissolve. Smiles. dissolved to mud and straw by winter rain. the dogs went wild and bayed a while. One cannot do justice to this collection in a review as it is jam-packed with material. The mapping of personalities and places is integral to the poet’s vision and the confessional passages of the book are complemented well by his experiments with form. At his best, Norton blends the complex tradition of Japanese verse forms and lyric poetry into something wholly his own. His poems are both original and informed by the tradition he loves. They are also visually and aurally satisfying. This is a book that celebrates life, a book for which many readers should make time. It’s Friday night, the moon is beginning to wane and the wind is all bluster. There will be light and I will be chasing it… but for now, settle in to a review by Patricia Prime. As always, Patricia’s review is generous in quoting from the collection – the latest release from Miriam’s Well Press, Migrant Moon by Barbara Mautone Robidoux – to give you a feel for the work. And from Patricia’s reading, it is some very fine work indeed. Read on! 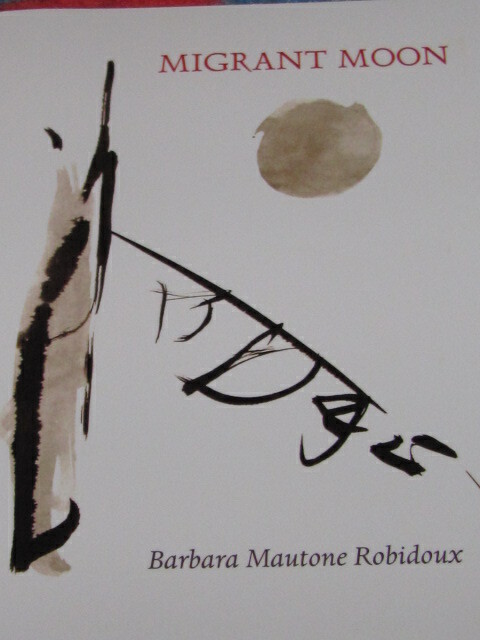 Migrant Moon is Barbara Mautone Robidoux’s second book of poetry. She also writes short stories and is currently working on a collection set on a reservation in northern Maine where she once lived. She now lives in Santa Fe, New Mexico. Migrant Moon is a collection of tanka, tanka sequences and haibun. It shows the poet’s journeys through her travels, her inner and outer life and through the movement of the seasons. What we have here is superb: it’s a collection that doesn’t disappoint in the slightest. Also, seeing the genres together increases one’s awareness that Robidoux’s poetry comprises various strands and feels like a unified body of work. sand. Trailer homes surround it. There are many poems to love in this book – poems that favour language, narrative and nature as well as music, mystery and adventure. Robidoux has written some remarkable haibun and tanka that can stand as good examples of both genres. You need to linger and let her words wash over you as you accumulate their subtle delights. My love of haiku is unflinching, as is my admiration for Patricia Prime’s work in the field, so it is with great pleasure I publish this review of Owen Bullock’s latest, breakfast with epiphanies. Owen Bullock has been writing haiku since 1999 and he has also published tanka, haibun, renga, longer forms of poetry and fiction. He has been the editor of Bravado, Spin, Kokako and Poetry NZ. The haiku are defined by their simplicity and the pure intensity of concision, and through openness, wit and humour. The poetry here is drawn from nature, grief and family to graduation, meditation and smoko. In spite of his invitation to examine the intricacies of his personal life, these topics are familiar and the haiku demonstrate clarity and single-mindedness. There are unforgettable lines such as “city dump / a little boy finds / an old speech bubble” and “first light / I have to let go / of yesterday.” The haiku have much to do with a fine use of nostalgia that gives one the sense that the poet is sharing with you a wealth of knowledge, wit and wisdom. 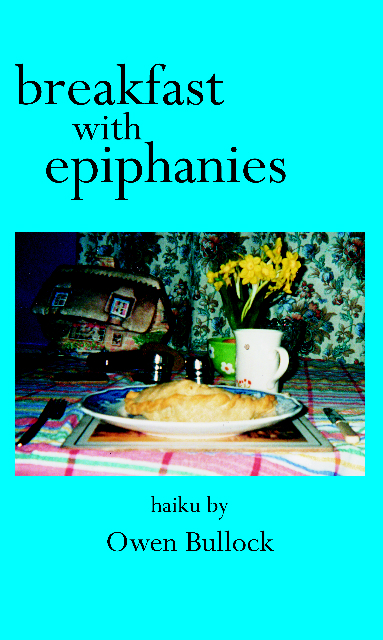 The language is uncomplicated and the combination of craft and simplicity makes breakfast with epiphanies a satisfying collection by one of New Zealand’s foremost haiku poets.